The TVR factory in Blackpool never built a "2200" model, and also never offered Triumph four cylinder engines in their Grantura, Vixen, or Tuscan models. 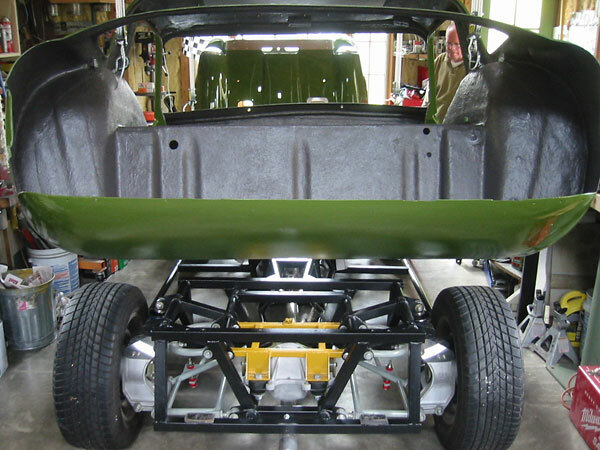 However, a significant portion of TVR production was unassembled kits. 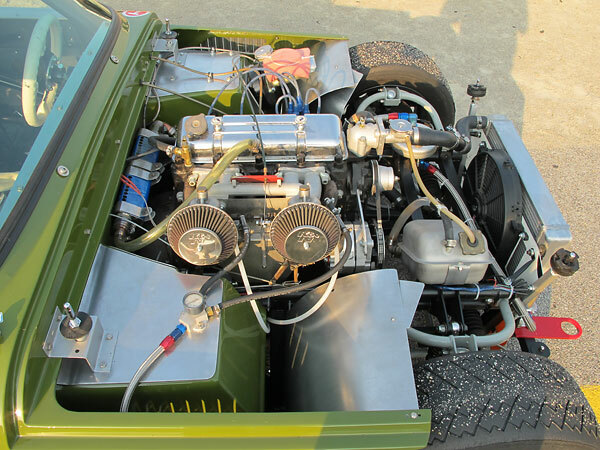 It's easy to imagine that a customer "in period" might have built up a special around Triumph TR4 drivetrain components or may have re-engined an MG-powered TVR 1800S with the larger displacement and more powerful Triumph TR4 engine of the period. On that premise, Dennis DeLap has created the work of art featured here. 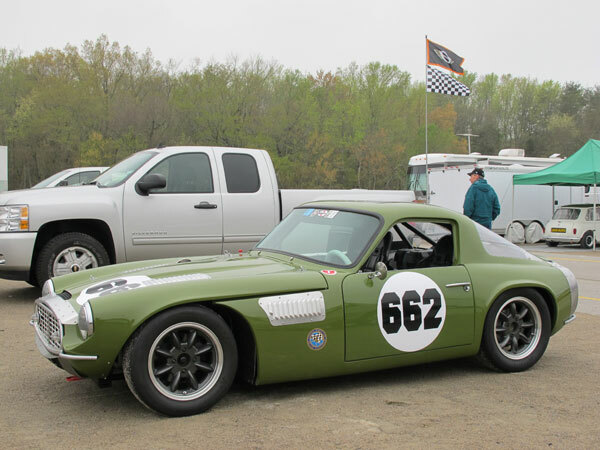 Dennis primarily races his TVR 2200 Special with the Vintage Sports Car Drivers Association, which schedules six race meetings per year in the upper midwest region. 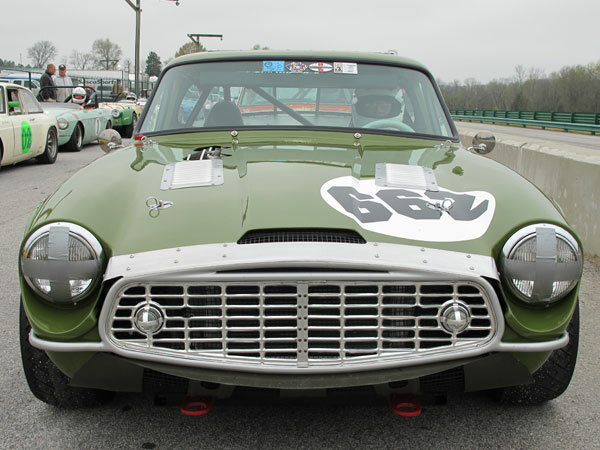 VSCDA is best known with race fans for hosting the famous "Kohler International Challenge with Brian Redman" and also the Elkhart Lake Vintage Festival. 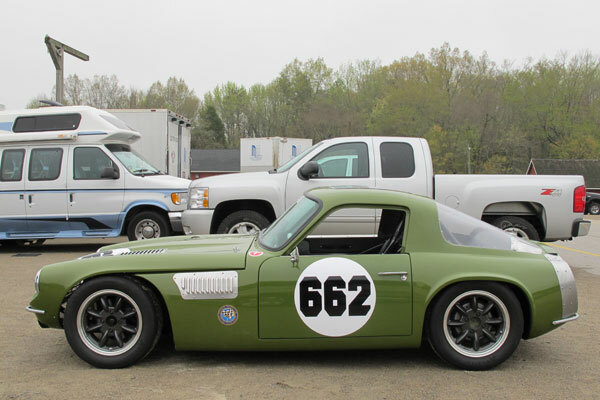 Dennis' TVR 2200 Special has been granted VSCDA's "Era Correct" medallion¹, which means that VSCDA has specially approved it to race in their vintage events even though it was built from a later model production car. Their rationale is that the car's major components were all readily available by 1967. 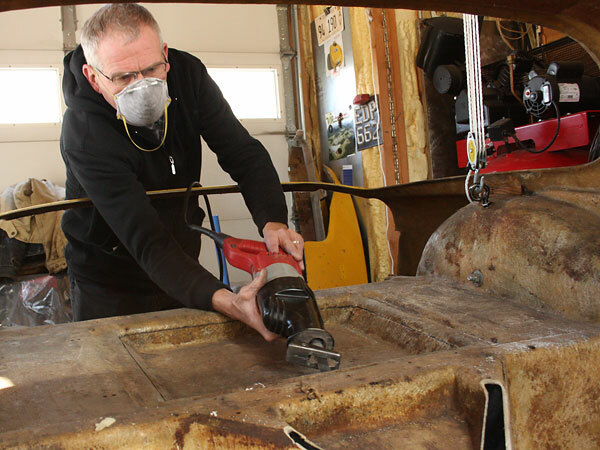 Dennis DeLap is a Triumph enthusiast and restorer who has become increasing active in vintage racing over the last decade. 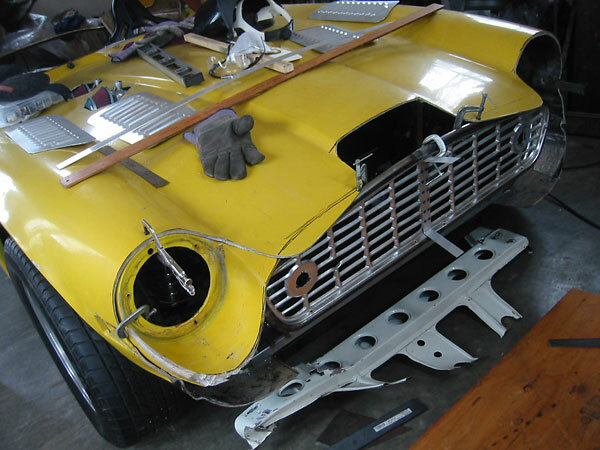 He started his racing career in a Triumph TR3A, but ultimately sold and shipped that car to a buyer in the Netherlands in 2006. 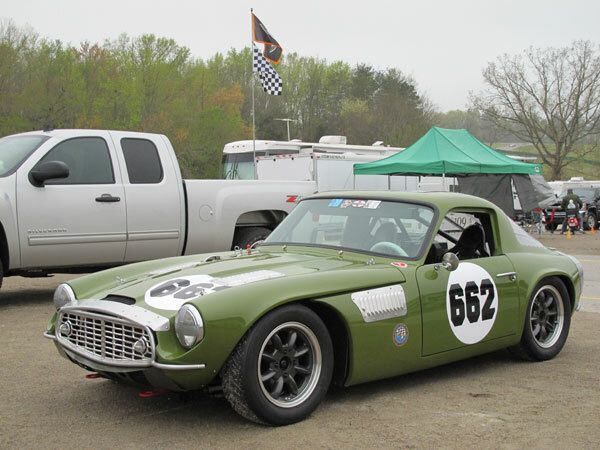 After the TR3A, Dennis began racing a 1964 Triumph TR4. 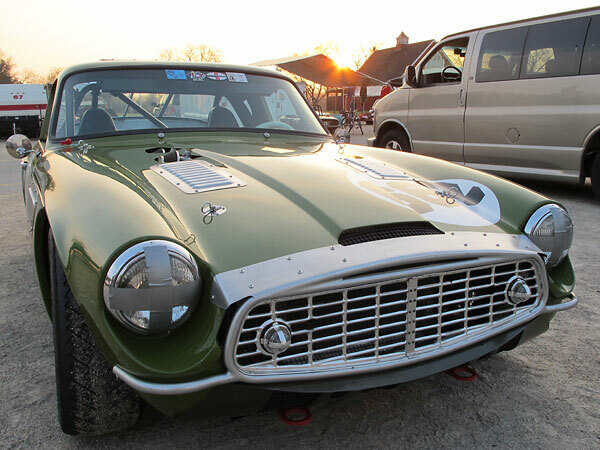 Now the TR4 is for sale. 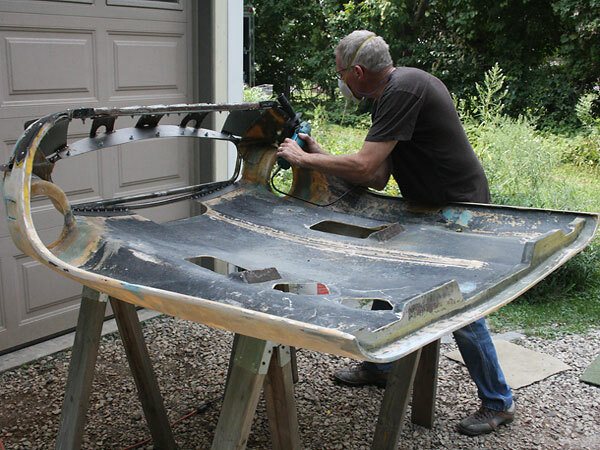 For Dennis, building and developing competitive vintage racecars is a serious hobby. Racing them is fun too. Whether building or racing, each different model brings new challenges. 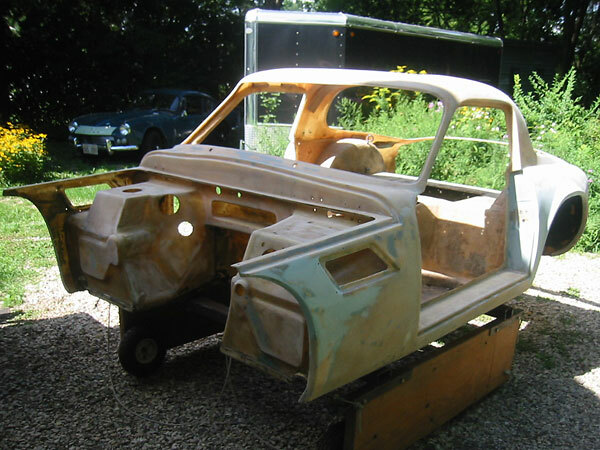 Through this season, Dennis' TVR will undoubtedly receive many upgrades. We'll keep an eye out, because it seems quite likely Dennis will be racing something even more impressive in coming seasons. 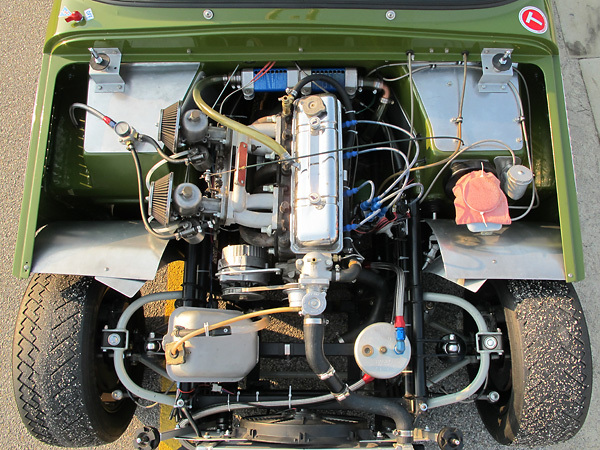 Engine: Triumph TR4 four cylinder engine, rebuilt by owner. 87mm bore by 92mm stroke yields a displacement of 2188cc. Stock Triumph crankshaft and connecting rods. Slightly shaved cylinder head. 9.53:1 static compression ratio. Stainless steel valves. British Frame and Engine model 149 camshaft (0.274" lift, 110° lobe center, and 282° duration.) Dual S.U. 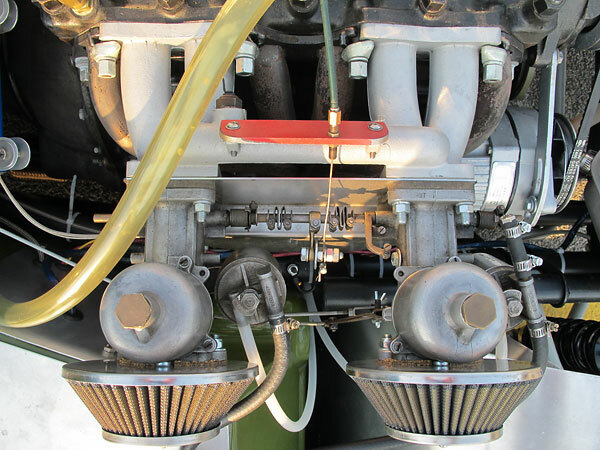 H6 (1.75") carburetors. K&N gauze air filters. Lucas distributor rebuilt and recurved by Advanced Distributors, with Pertronix Ignitor breakerless module. Pertronix Flame-Thrower 3.0 Ohm ignition coil. NGK spark plug wires. Oberg UFO tattletale oil filter. 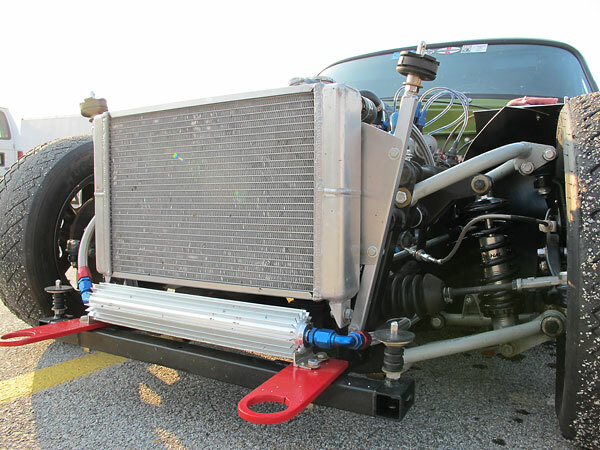 Cooling: aluminum crossflow radiator. Hayden 12" electric fan. 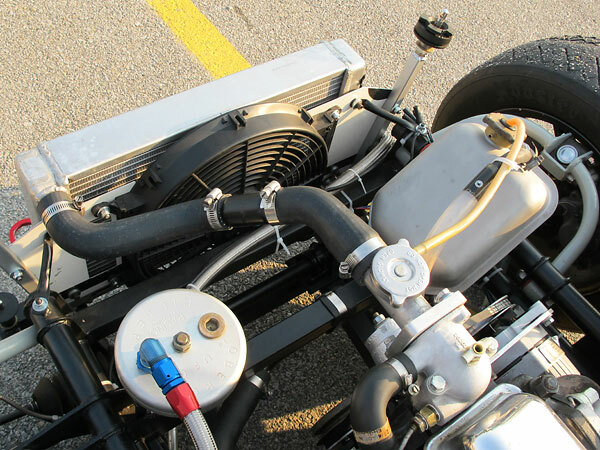 Procomp extruded aluminum oil cooler. Exhaust: TSI four-into-one 2.5" header. 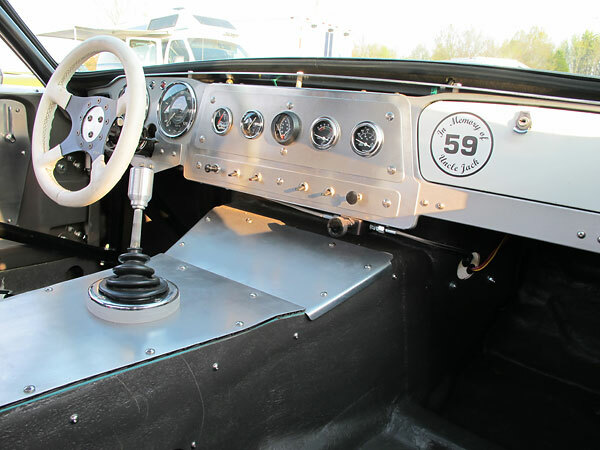 Transmission: stock Triumph TR4 4-speed. Lightened TR4A steel flywheel. Stock Triumph TR4A/TR6 clutch disc and pressure plate. Girling master cylinder. 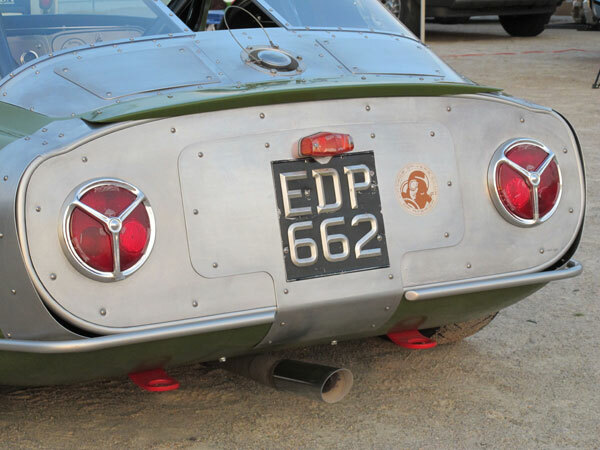 Rear End: TR4A housing. Detroit Locker differential. 3.73:1 gear set. Shortened Datsun 240Z halfshafts. 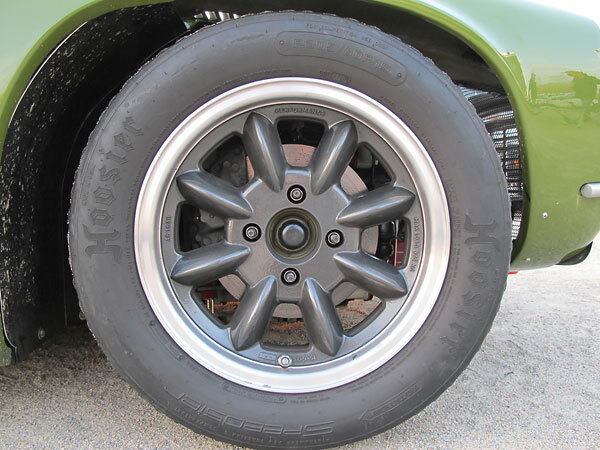 Custom modified Datsun 240Z hubs. Front Susp. 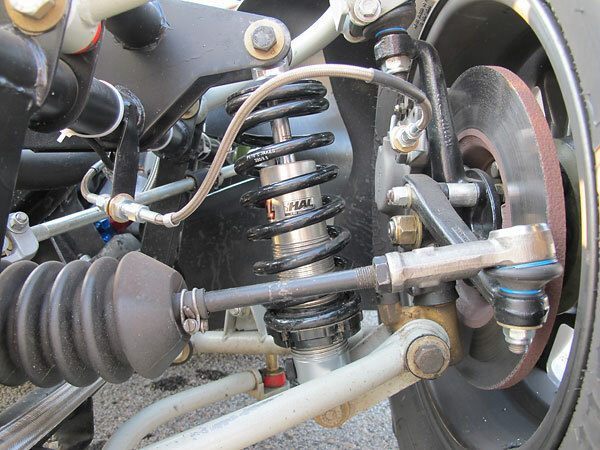 : unequal length dual wishbone front suspension. QA1/Hal single adjustable aluminum shock absorbers. Pete & Jakes 300#/inch, 2.5"x9.5" coil springs. (Stock springs were only 175#/inch.) Triumph Herald (Alford & Alder) forged uprights. TR4/6 stub axle. Triumph TR4 steering rack. Triumph GT6 upper steering column mated to TVR lower steering column. 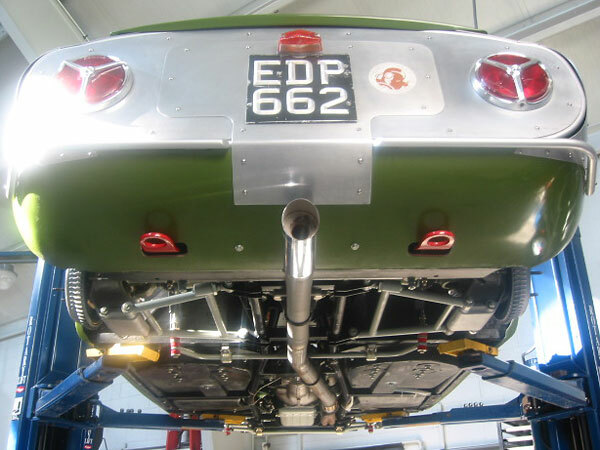 Triumph GT6 7/8" anti-sway bar, modified. Rear Susp. 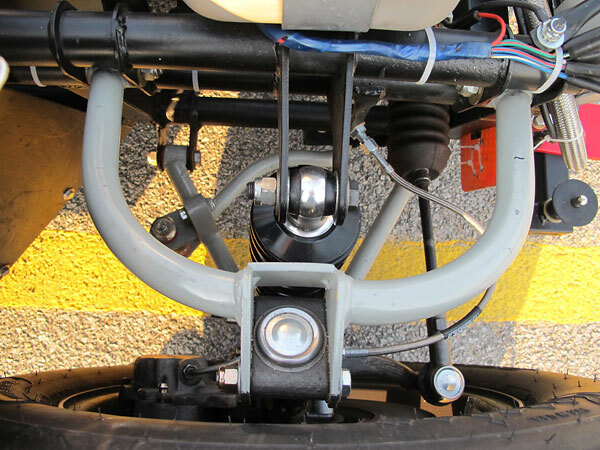 : unequal length dual wishbone rear suspension. 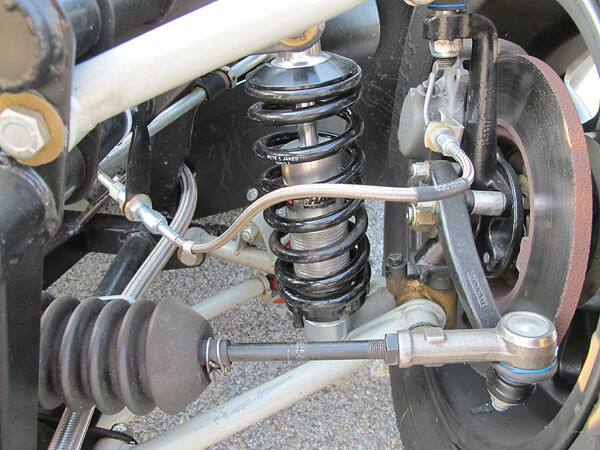 QA1/Hal single adjustable aluminum shock absorbers. TVR proprietary cast uprights. 225#/inch, 2.5"x9.5" coil springs. (Stock springs were 110#/inch.) Addco 3/4" TR4 anti-sway bar. Brakes: (master) Girling tandem master cylinder (TR250/TR6 type). Bias valve mounted on dashboard. (front) Girling 16PB (TR4) calipers marked 64326046 (LH) and 64326047 (RH) respectively, and solid 10.75" rotors. (rear) Datsun 240Z finned drum brakes. 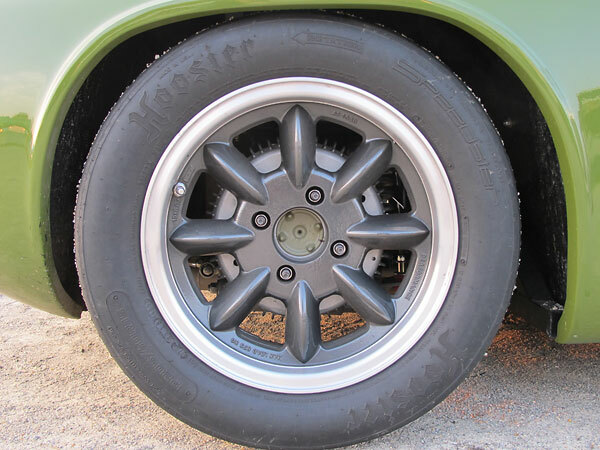 Wheels/Tires: Performance "Superlite" 15x6.0 8-spoke aluminum wheels with Hoosier Speedster P205/60R15 tires. 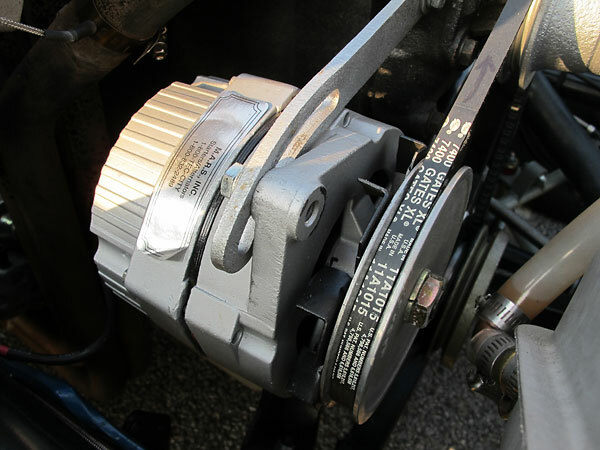 Electrical: Delco-Remy alternator with Moroso oversize pulley. TSI gear reduction starter. 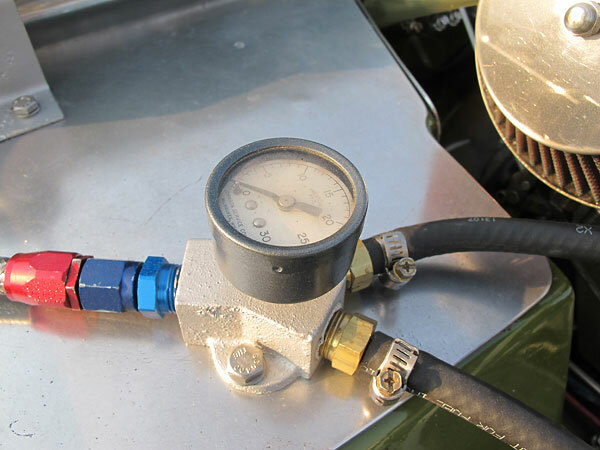 Instruments: (left to right) Jaeger cable driven tachometer (0-6000rpm), Smiths speedometer (0-120mph), Coolant temperature gauge (100-280F), Smiths oil pressure gauge (0-100psi), Westach dual EGT gauge (700-1700F), Datcon voltmeter (8-18V), Datcon oil temperature gauge (100-240F). 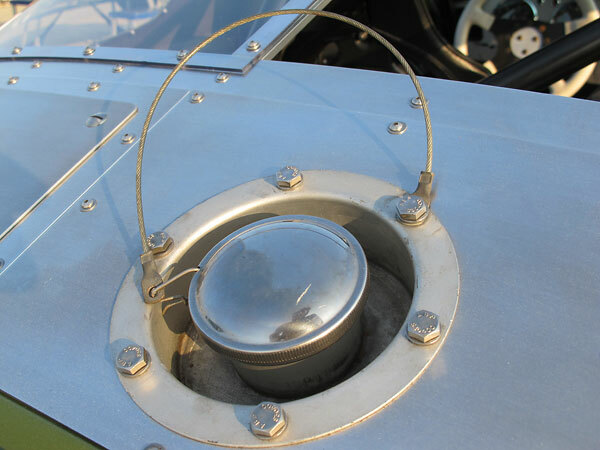 Fuel System: Fuel Safe "Sportsman" steel-can 8-gallon (SM108A) fuel cell. Facet model 60104 1.5-4psi fuel pump. 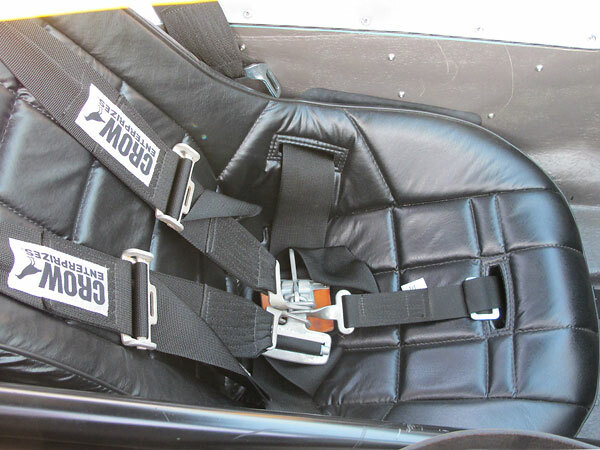 Safety Eqpmt: Summit Racing plastic bucket seats (part# SUM-G2100). Crow Enterprises latch and link safety harnesses. Forumuling steering wheel mounted on a quick release hub. Wink 5-panel panoramic mirror. Handheld fire extenguisher. 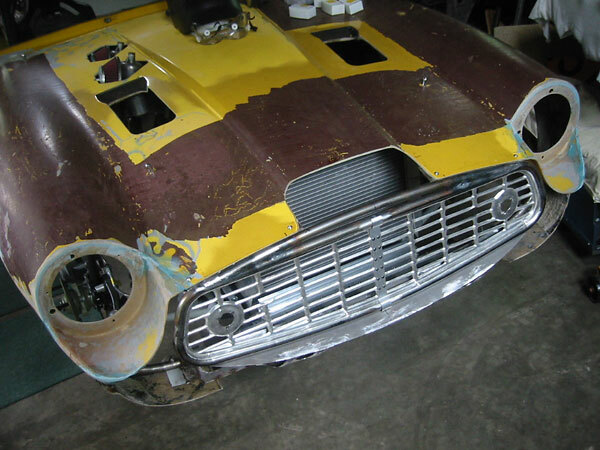 Completion: this car was originally purchased as a TVR 2500M, with front and rear collision damage. 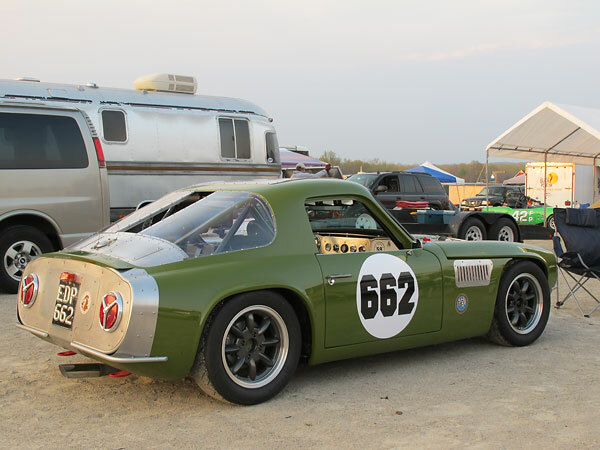 It's rebuild into a racecar was completed in the Spring of 2010, and its first race outing was the VSCDA Blackhawk Classic in Illinois. Jack Drews, Dennis learned the subtleties of rebuilding Triumph engines. 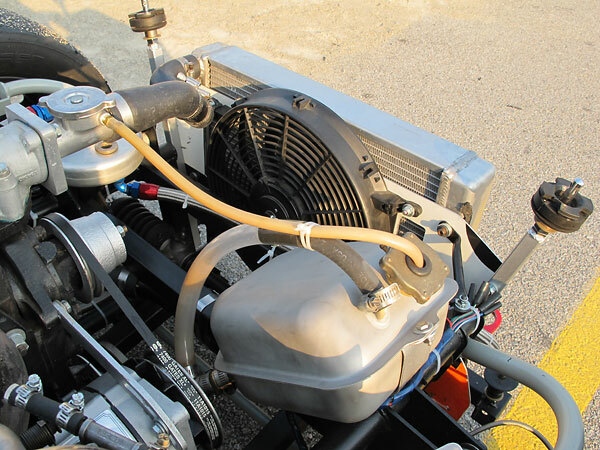 Girling tandem master cylinder (TR250/TR6 type). Pertronix Flame-Thrower 3.0 Ohm ignition coil. NGK spark plug wires. 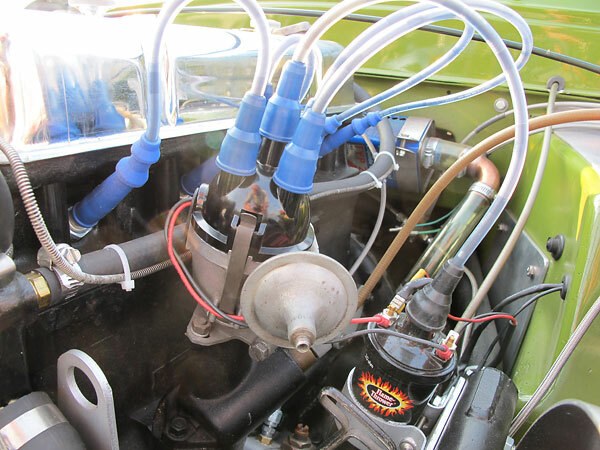 A second lead to the distributor hints that a Pertronix Ignitor is installed. Aluminum crossflow radiator. Hayden 12" electric fan. 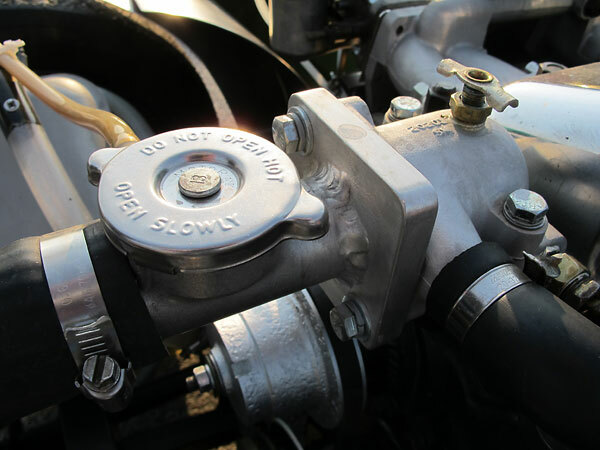 The cooling system pressure cap is closely coupled to the thermostat housing. 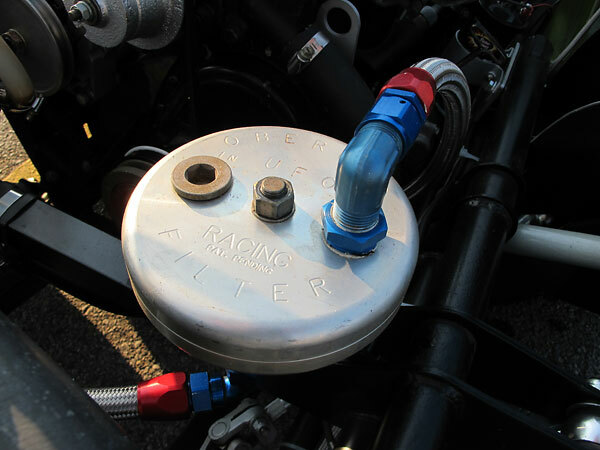 "Oberg UFO Racing Filter" tattletale oil filter. BritishRaceCar.com will have to cut back plans for continued growth if we can't find more financial support. If you like what you've found here, and you want to see more, please click here and follow the instructions. 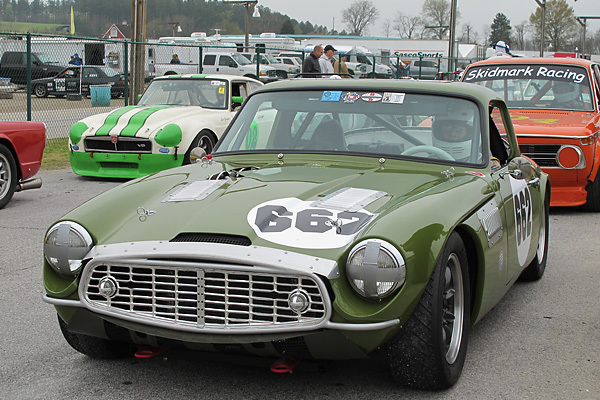 Readers like you keep BritishRaceCar.com online and growing through voluntary financial contributions. Huge stainless steel coolant overflow tank. 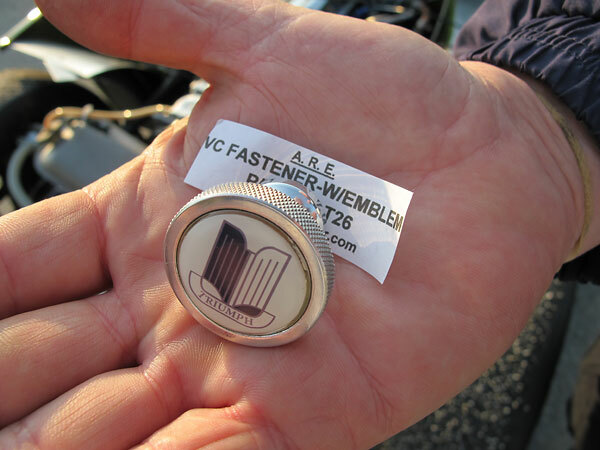 Alexander Racing Enterprises valvecover fastener with Triumph emblem. 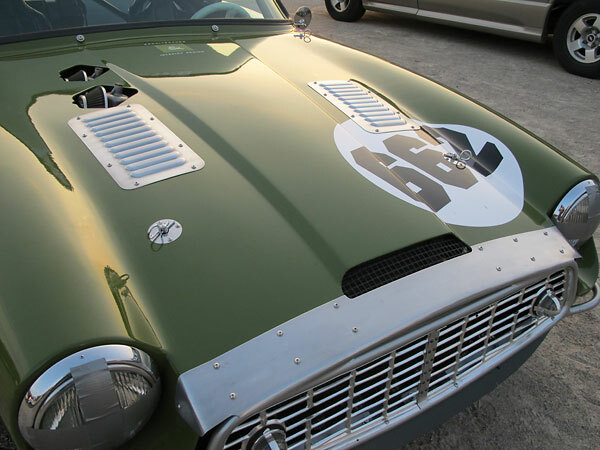 with a particular emphasis on Triumphs and Triumph-powered race cars. 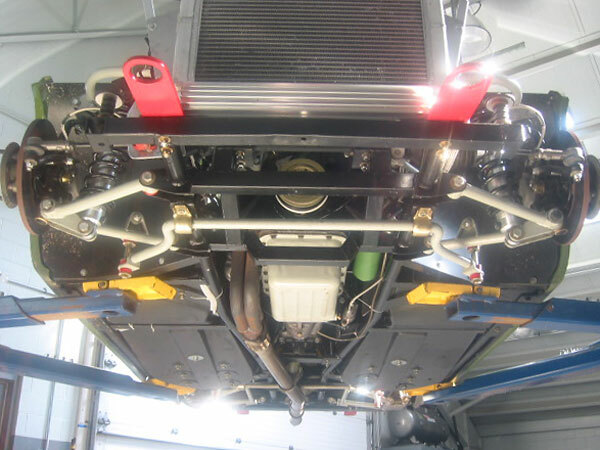 Delco-Remy alternator installed with Moroso oversized pulley and Gates XL belt. M.A.R.S. 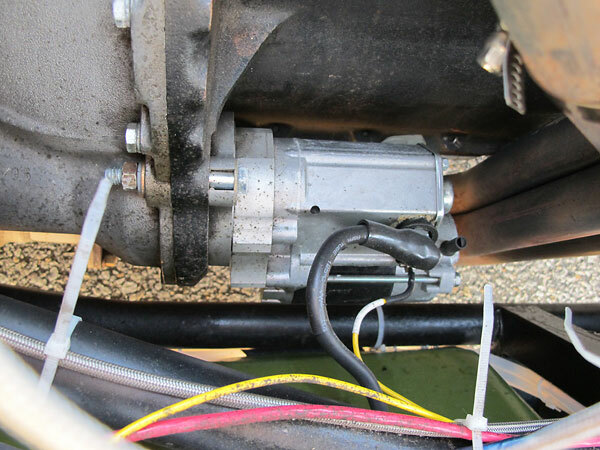 Inc. of DeKalb Illinois rebuilds vintage alternators and starters. Gear reduction starter purchased from TS Imports. Dual S.U. 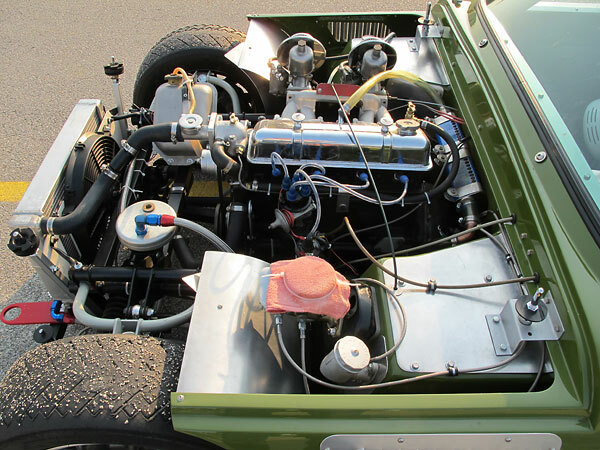 H6 carburetors mounted on a Triumph TR4 aluminum intake manifold. Johnson Service Co., Milwaukee Wisconsin 0-30psi fuel pressure gauge. 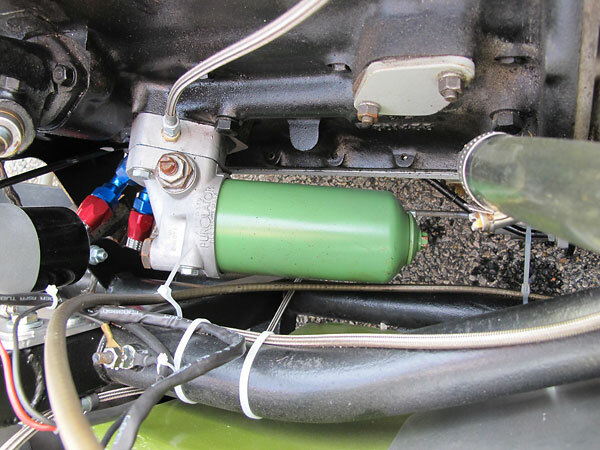 Home-made breather tanks constructed from ATE brake fluid cans. Hood pin mounting bracket detail. 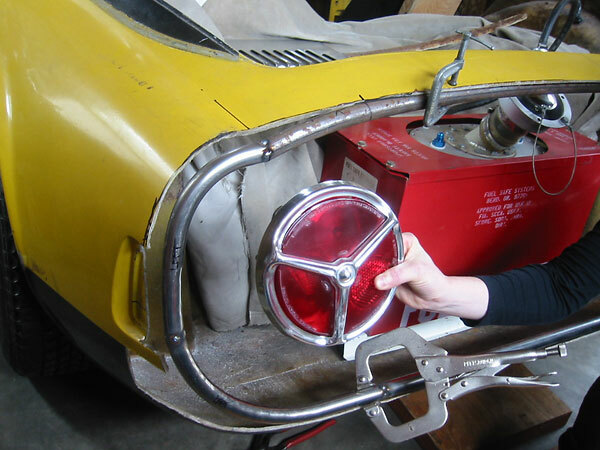 Unequal length dual wishbones mount to Triumph Herald (Alford & Alder) forged uprights. 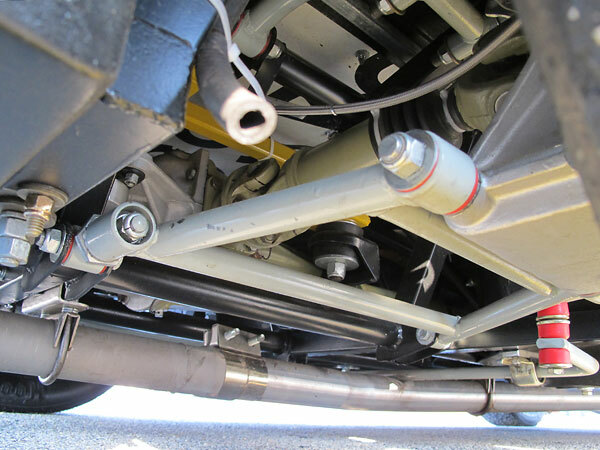 Triumph GT6 7/8" anti-sway bar, with modified end connections. QA1/Hal adjustable aluminum shock absorbers. Pete & Jakes 300#/inch 9.5"x2.5" coil springs. 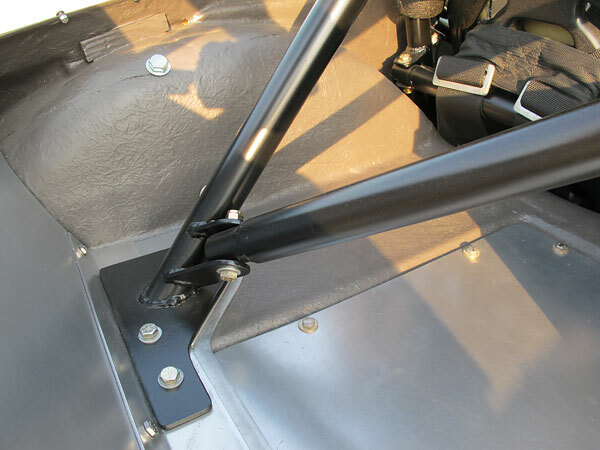 Unequal length wide-based dual control arms mount TVR proprietary cast uprights. 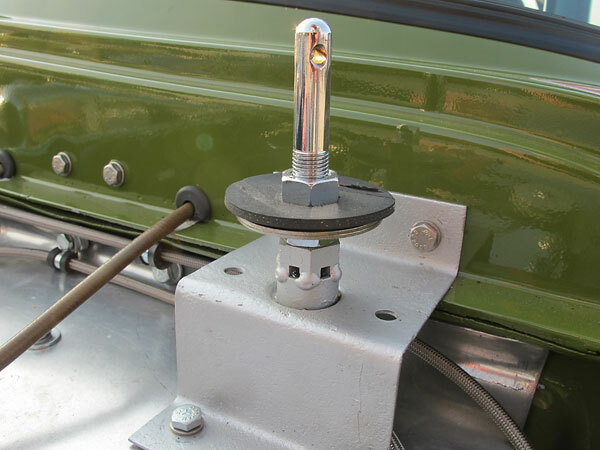 QA1/Hal single adjustable aluminum shock absorbers with 225#/inch, 2.5"x9.5" coil springs. (Stock springs were 110#/inch.) Addco 3/4" TR4 anti-sway bar. gauge, Westach dual exhaust gas temperature gauge, Datcon voltmeter and oil temp gauge. 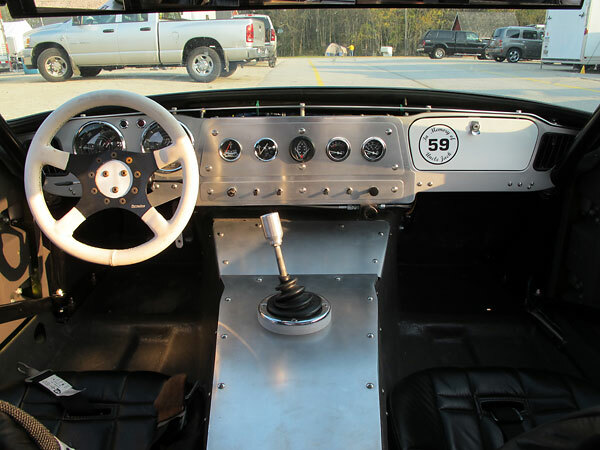 A valve mounted at the lower edge of the dashboard is for adjustment of front-to-rear brake balance. 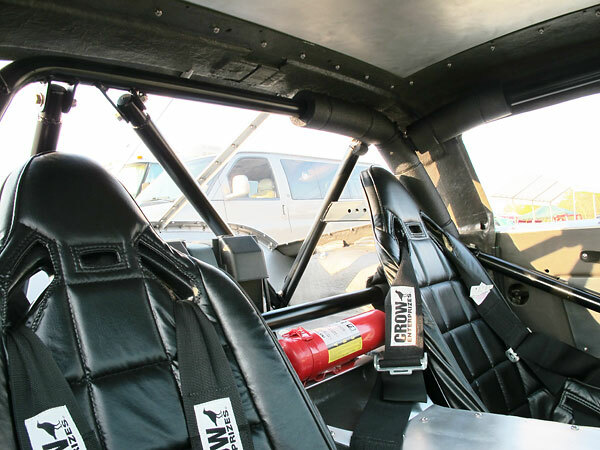 Summit Racing plastic bucket seats (part# SUM-G2100). Crow Enterprises latch and link safety harnesses. 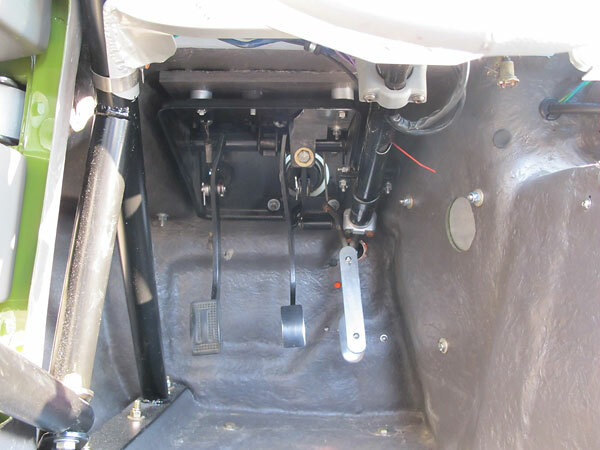 Triumph GT6 upper steering column mated to TVR lower steering column. 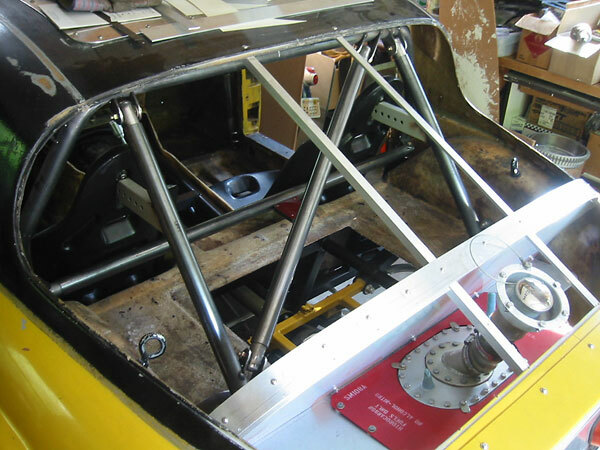 Dennis designed and fabricated his own roll cage. He found a local shop to make the bends for him. including access to the fuel cell. 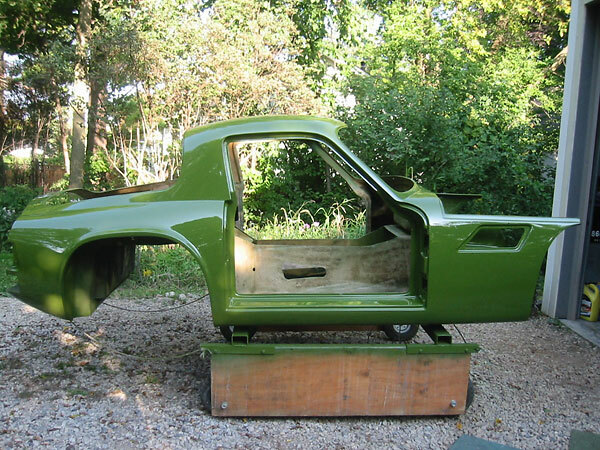 Early TVR's didn't have hinged cargo area hatches. Enjoying this article? www.BritishRaceCar.com is partially funded through generous support from readers like you! 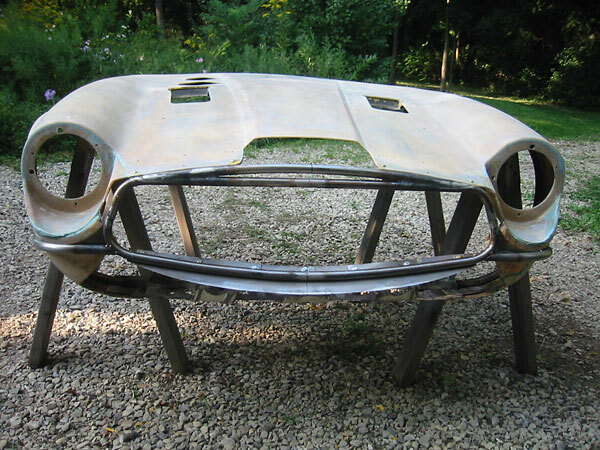 This formed sheetmetal piece (on the ground here) is from the inner structure of a Triumph TR4 bonnet. 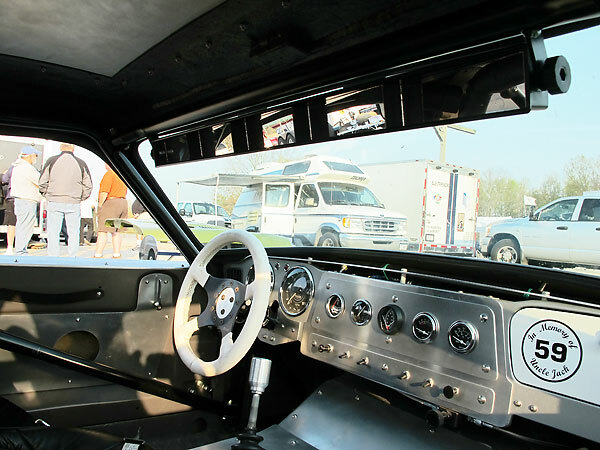 position, which helped Dennis recreate a profile more similar to late sixties TVRs. Whoa! 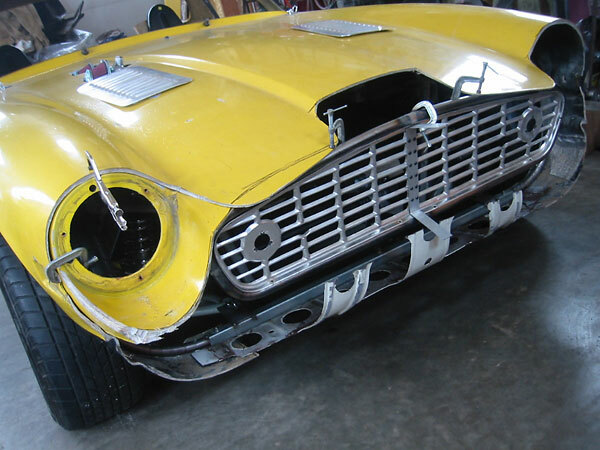 Just hours ago Dennis must have decided that the Triumph TR3A grille works better upside down. Dennis cuts an access hole that will facilitate easily servicing the differential. Ford Cortina MkI taillamps, as used by TVR on their Grantura 1800S and MkIV models. 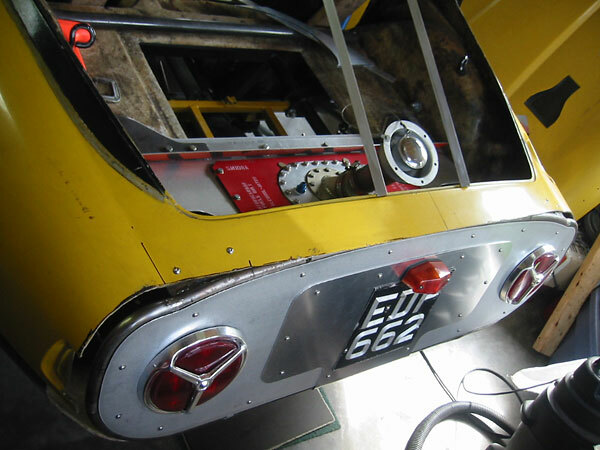 A metal firewall is required between the fuel cell and driver compartment. That'll be the next step. The eyebolts seen here will come in handy later, when the body is lowered onto the frame. A black foundry slag media was used to cut through to bare fiberglass. Just a little bit of filler was used to level and refine surfaces. 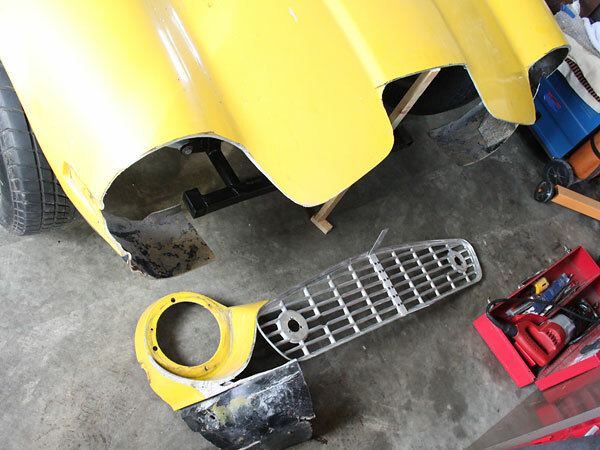 Back to work on the custom-fabricated steel front grille surround. Follow Dennis' good example: always protect your lungs with an appropriate facemask! 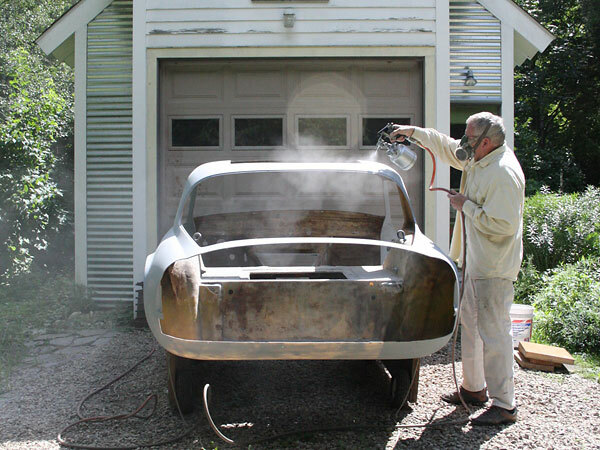 The old-school way: four coats of lacquer primer, wet-sanded after each coat. 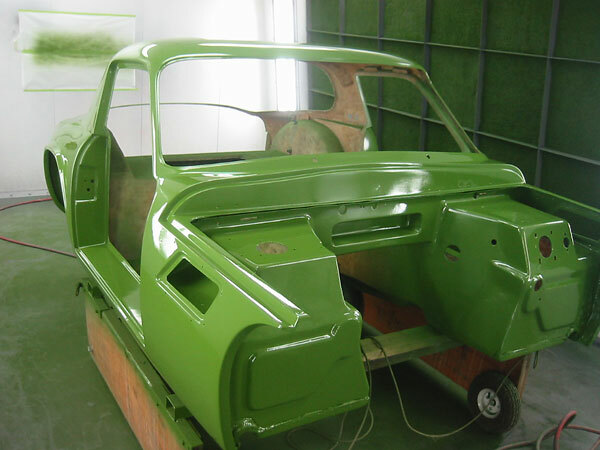 One big advantage of lacquer finishes is that each coat dries very quickly. 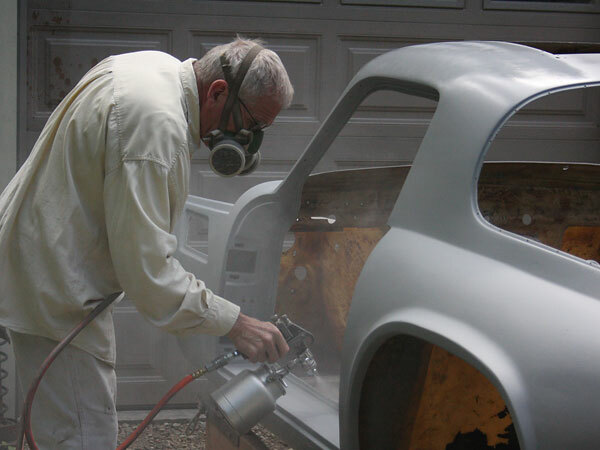 Quick drying minimizes how much airborne dust and debris can land in the finish. "Cessna Meadow Green" PPG acrylic enamel paint (PPG# 47312). 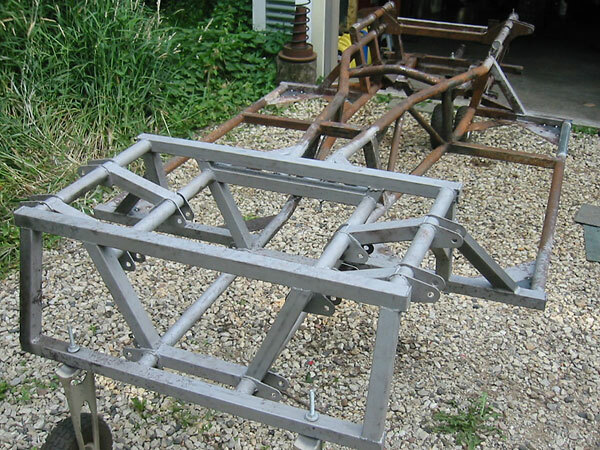 Take note of the handy and versatile cart Dennis used to move his TVR in and out of the shop. 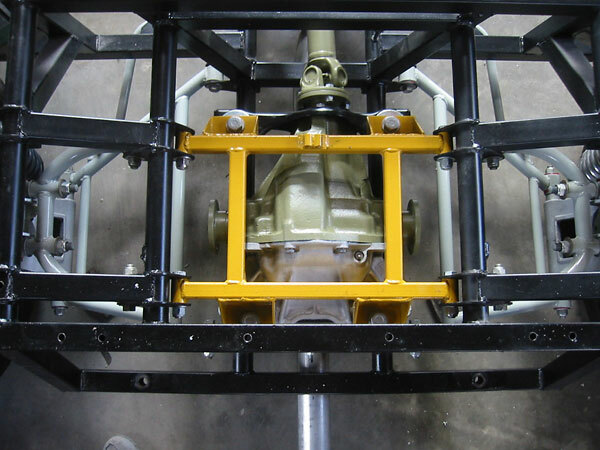 By removing a top cover, the whole transmission/driveshaft tunnel can be accessed. 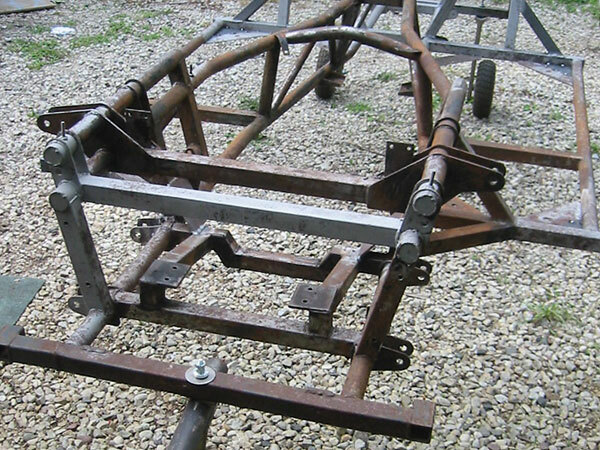 This is the original TVR 2500M frame which Dennis sand blasted and repainted, replaced bushings, etc. Sandblasting brings the steel to this mat gray finish. 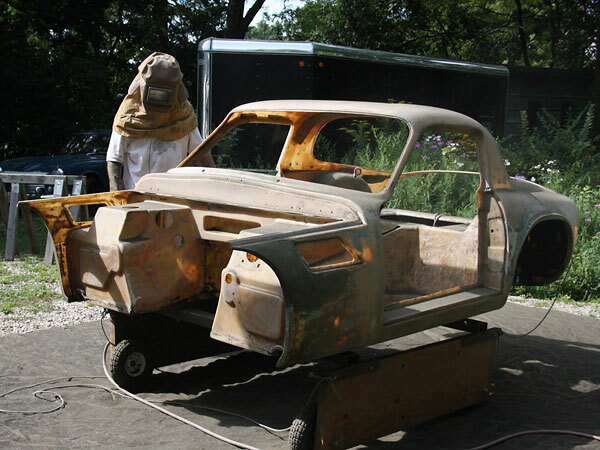 Then a coat of tough black chassis paint protects the frame from future corrosion. over earlier TVR designs. Both round and square section 14-gauge and 16-gauge tubing were utilized. 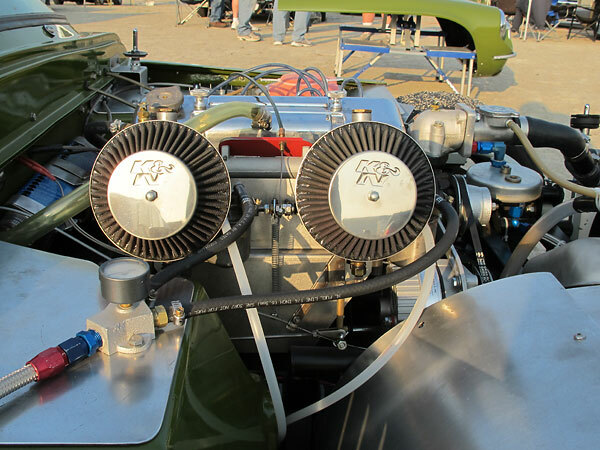 TR4A housing with Detroit Locker differential and 3.73:1 gear set. 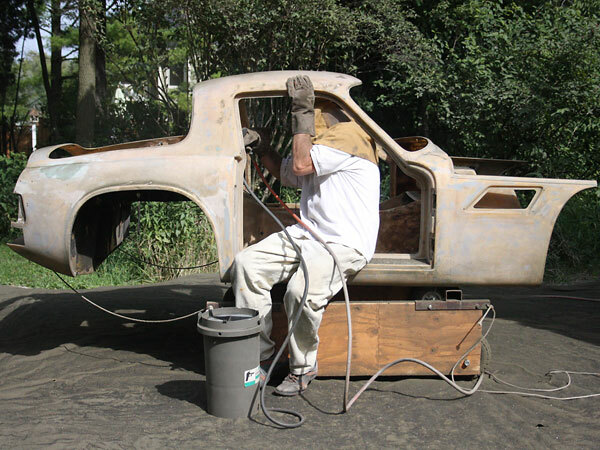 Gently lowering the body down onto the chassis. Clever use of pulleys and cords made raising and lowering the body a one-man job. 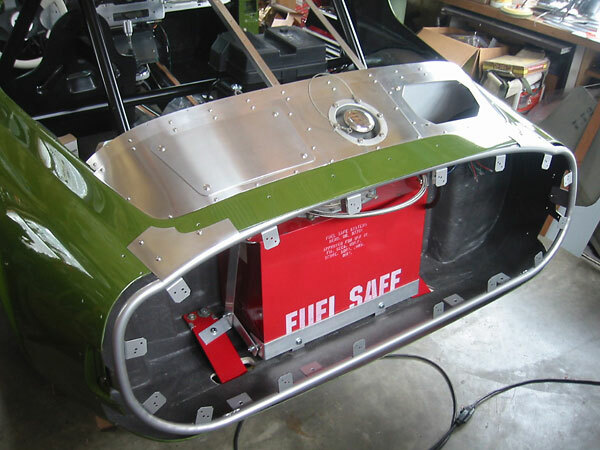 Fuel Safe "Sportsman" steel-can 8-gallon (SM108A) fuel cell. 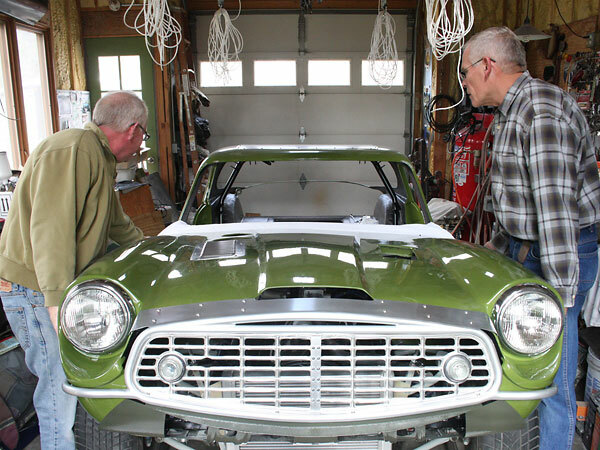 A friend helps with installation of the bonnet assembly. which is an annual event at Virginia International Raceway. but casual enthusiasts can be excused for not recognizing the specific year and model of this example. 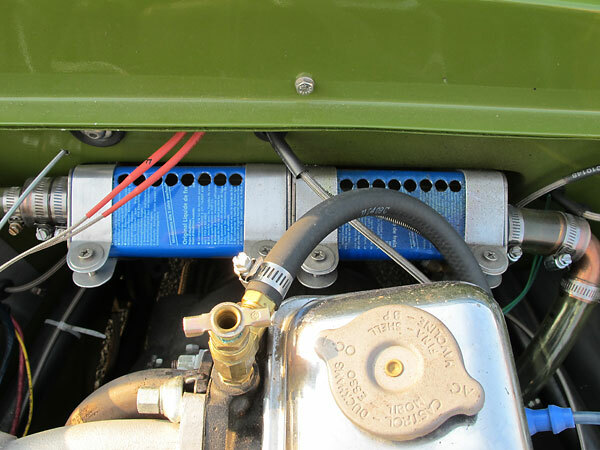 cars with Triumph four cylinder engines or Triumph TR3A grilles, a kit assembler could have done so. 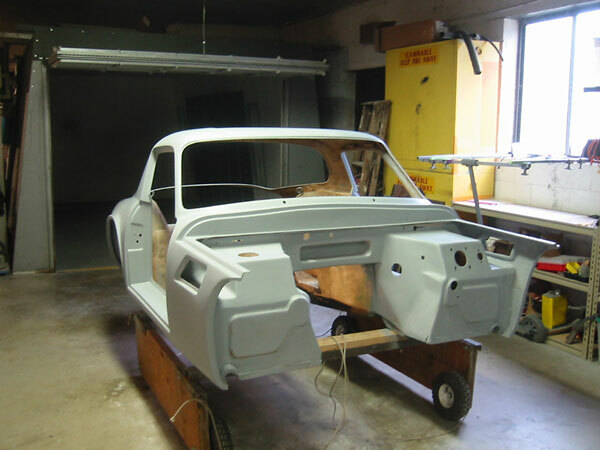 TVR designed this family of bodyshells to utilize Ford Consul MkII (1956-62) windscreens. 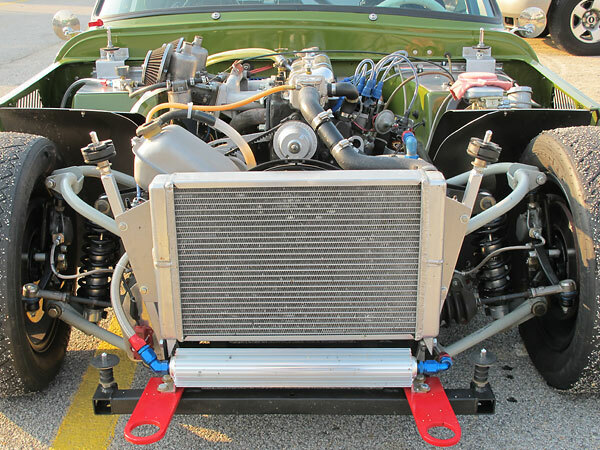 of TR6-spec 2.5L engines. 947 were produced, almost all of which were exported to the United States. 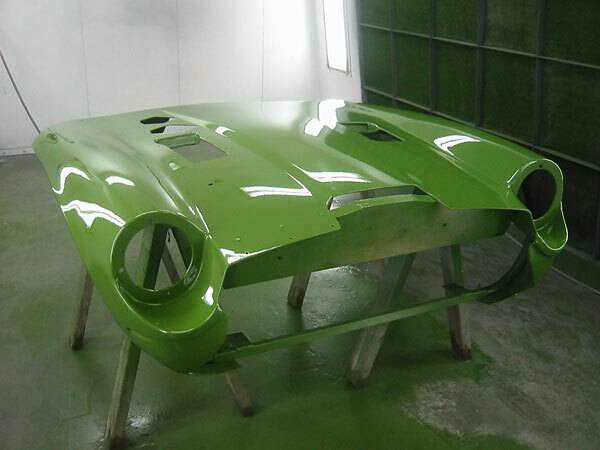 bodywork, this car more nearly resembles TVR's Vixen (1967-73) and Tuscan (1967-71) models. on the Grantura 1800S. 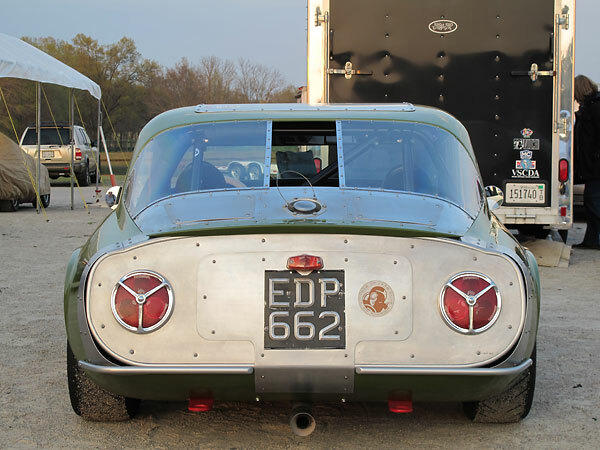 Like TVR, Dennis installed round Ford Cortina "ban the bomb" taillamps. Very few old racecars get such an excellent paint job! 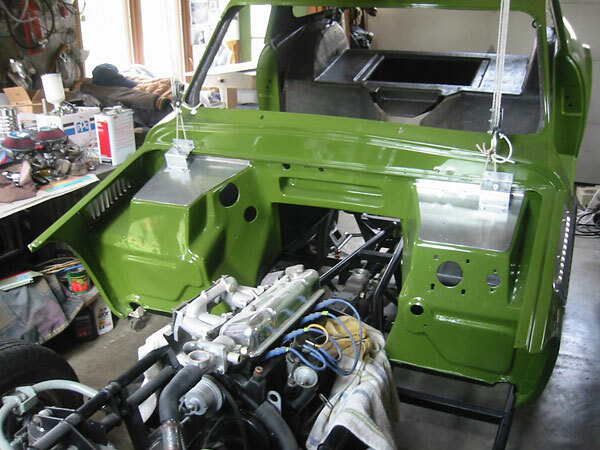 Dennis created louvered aluminum panels to cover holes in the 2500M bonnet. Louvered aluminum panels on the fender sides also obscure the age of the car. 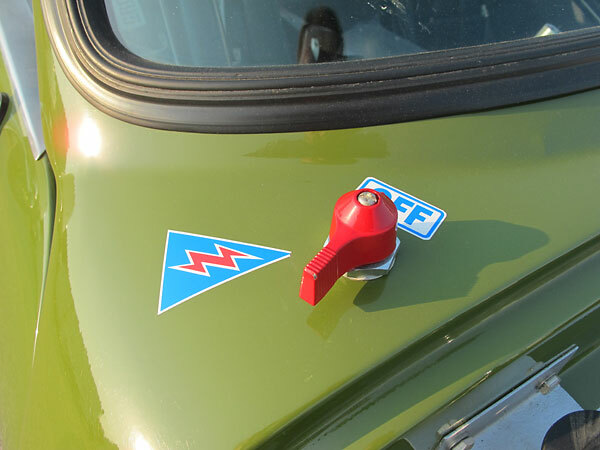 TVR went through a variety of side vent trim designs from the sixties forward. Notice also the Vintage Sports Car Drivers Association sticker. VSCDA Era Correct Production Class¹ sticker. 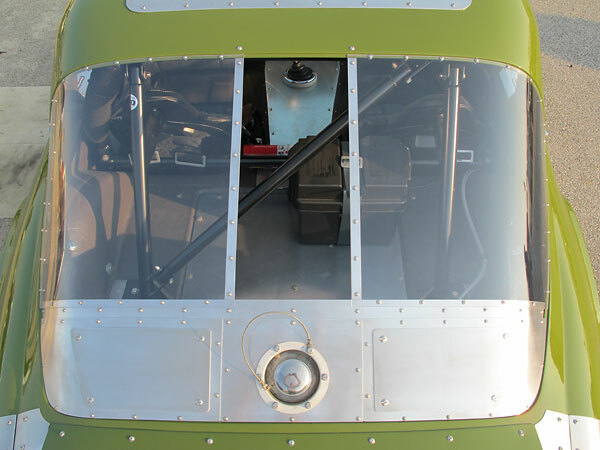 Small access panels on either side of the fuel filler are each secured with four quarter-turn fasteners. 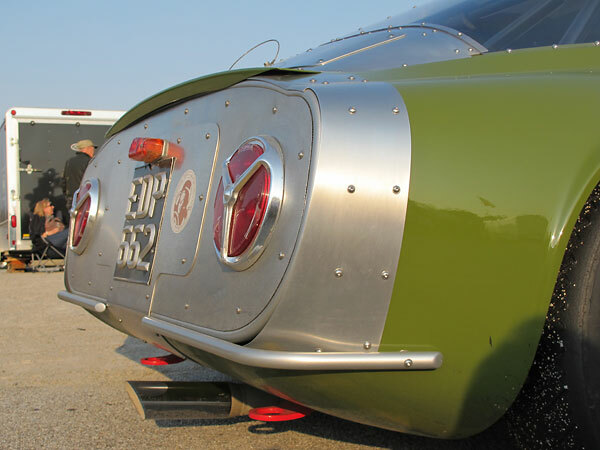 that a truncated rear is often aerodynamically superior to one with rounded trailing edges. 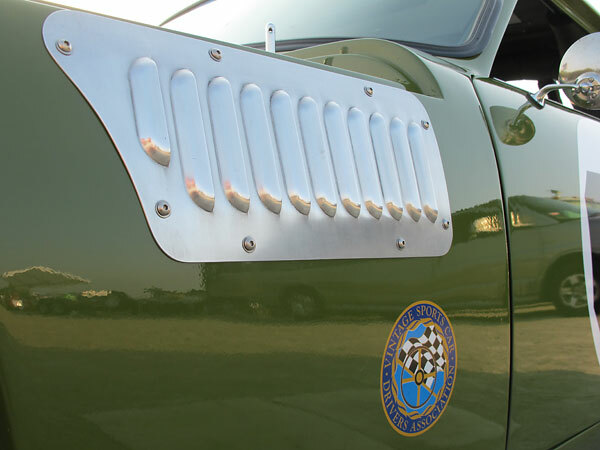 Automotive designs with this feature are often called "Kammbacks" or "K-tails". 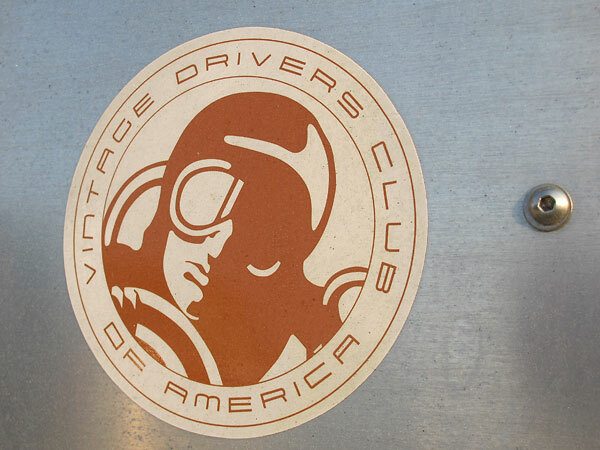 Vintage Drivers Club of America sticker. Dennis is an architect by day. You can clearly sense that he takes joy in subtle aesthetic details. Performance "Superlite" 15x6.0 8-spoke aluminum wheels. Hoosier Speedster P205/60R15 radial tires. 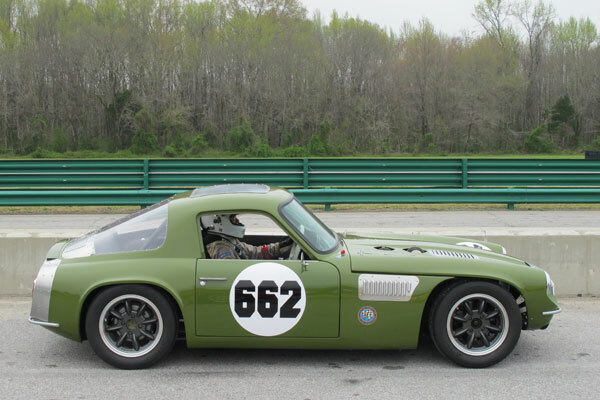 (1) Although Dennis' TVR was born in the seventies and is rightly and unashamably labeled a "special", it has been approved by VSCDA under that organization's "Era Correct Production Class" program. 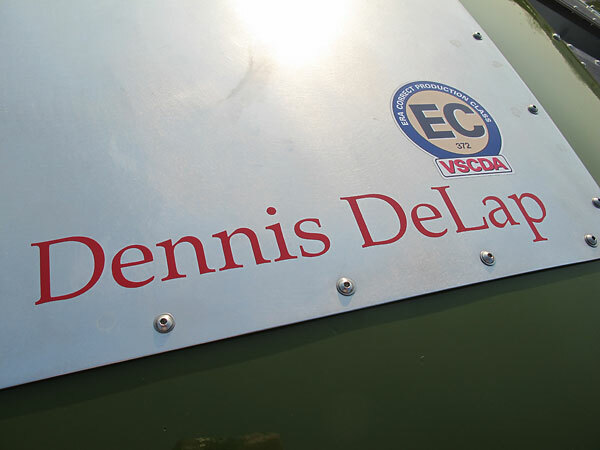 VSCDA's official definition of Era Correct qualification is written as follows: "Production based race cars qualify for the VSCDA Era Correct (EC) Medallion decal when preparation [sic] to an appropriate period GCR. Interpretation will be determined by VSCDA concerning the primary specifications and components of the car which need to be period correct to qualify. These will include weight, engine model, engine displacement, transmission, brakes, shock absorbers, induction system, body work and overall appearance." 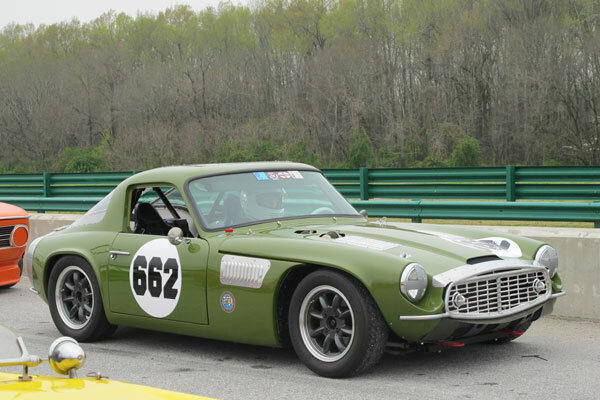 Unless otherwise noted, all photos shown here are from April 2011 when we viewed the car at VDCA/VRG's "Wild Hare Run" at Virginia International Raceway. Photos by Curtis Jacobson for BritishRaceCar.com, copyright 2011. All rights reserved. 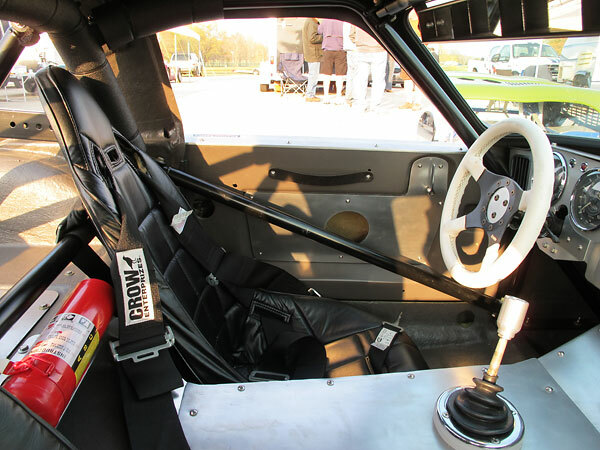 All photos in the "Build Shots" section (above) were provided to BritishRaceCar.com by Dennis DeLap and are published here by exclusive permission. These photos have been modified/optimized for online publication by Curtis Jacobson for BritishRaceCar.com, copyright 2011. All rights reserved. 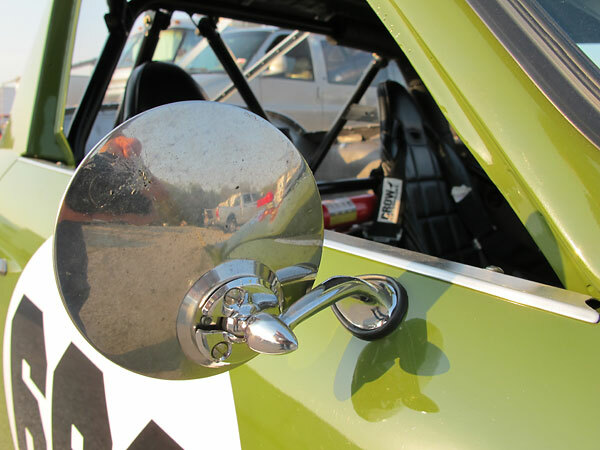 You're invited to discuss anything you've seen here on The British Racecar Motorsports Forum!